It seemed lethal for Crystal Palace to continue their Premier League campaign under the tutelage of Ian Holloway after they bagged defeats for several successive weeks. Surviving the season was almost impossible at the time and reaching the rock-bottom even before the season finale further exacerbated the situation. Insert Tony Pulis, the never-been-relegated coach from Newport, Wales, and everything seemed to start falling into place. From his debut alone, the Eagles already breathed life into their form. His stunning performance for the remainder of the season made Palace more compact, aggressive, wise, inspired, and most importantly, score-minded. From the drop zone up to the table’s near-top half section, Palace have beaten the odds. No wonder Pulis became an instant household name among EPL supporters. The former Stoke City manager has repeatedly gained the distinction of being a “hard taskmaster” who capitalizes on old-school [but still effective] tactics rather than trying out novel things that are otherwise risky and potentially low-yielding. He does, however, make necessary improvisations when the situation requires him to do so. This comes with his personal package of being a man who has been into some of life’s most challenging scenarios, and so non-sense approaches to engaging in battles is almost non-existent in his vocabulary. 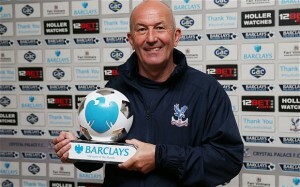 Pulis wants Crystal Palace to build on their recent achievement and use it as benchmark for their fixtures next season. The feat of escaping relegation was more than just a survival worthy of celebration. It was a seriously commendable turnaround of a struggle that nearly made the side a complete disaster in the competition. In fact, just recently, Pulis’ success at this particular pedestal was recognized when he was named the “Premier League Manager of the Year.” Next season, he aims to be in an even more absolute control of the club to help them match his personal drive. Pulis’ determination is unequaled. His zeal is outstanding and his ability to put devastations at bay is a major force that would definitely push any club into their genuine peak. He is not a perfect coach, but he can readily iron out flaws that he might see as detrimental to his side’s streak.